Since starting this here foodie blog, a few friends and colleagues have asked me about my favourite restaurants. Naturally, being a bit of a nerd, I do keep an excel document that keeps track of such pertinent information. Detailing the amount of times each one has been visited and logging such information as the number of Michelin stars and/or ranking in the S.Pellegrino list (and Miele Guide for those in Asia). Coming up with a definitive (for now) list, I have considered the quality of food, service, décor, ambience, location and in some cases, what I can only describe as a certain ‘x factor’ or ‘je ne sais quoi’ that makes them stand out from the crowd. I would like to point out that I visited many of the restaurants on the list before starting my blog, consequently not all the food was photographed and where it was, the photographs are not always of great quality. Also no notes were taken therefore I have to rely on memory alone – thankfully all on the list did provide memorable experiences; so I hope my recollections do them justice! 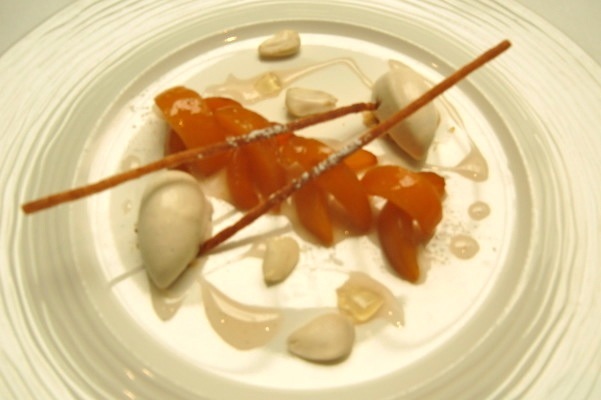 We visited Pied à Terre in June last year; at the time Shane Osborn was in charge of the two Michelin starred kitchen. Sadly, following his subsequent departure, the restaurant went on to lose one of its stars. Eleven years prior, the same thing happened when Shane took over from Tom Aitkens but he managed to restore the two star status a couple of years later; successfully retaining them throughout his tenure. Let’s hope that Shane’s replacement, Marcus Eaves, joining from L’Autre Pied (Pied à Terre’s Michelin-starred sister restaurant) can repeat his former mentor’s achievements. Having seen glimpses of the Charlotte Street restaurant (and owner David Moore) on the television show ‘The Restaurant’ with Raymond Blanc, I was keen to eat there on my next visit to London. 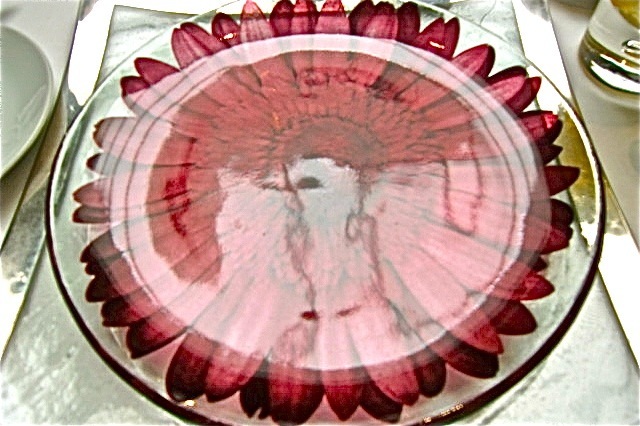 Having looked on their website, I also thought that my wife would appreciate the gorgeous pink and purple gerbera emblazoned place settings –flowers which are always special to us, they are what we had at our wedding. A trio of amuse bouche soon followed, featuring a tasty little gnocchi topped with a shaving of Parmesan; a light, cheese topped mousse (which I seem to recall being pumpkin, although on reflection this would have been an unusual choice for the season) and, the third component, a delicate foie gras mousse, sandwiched between two paper-thin poppy seed wafers. 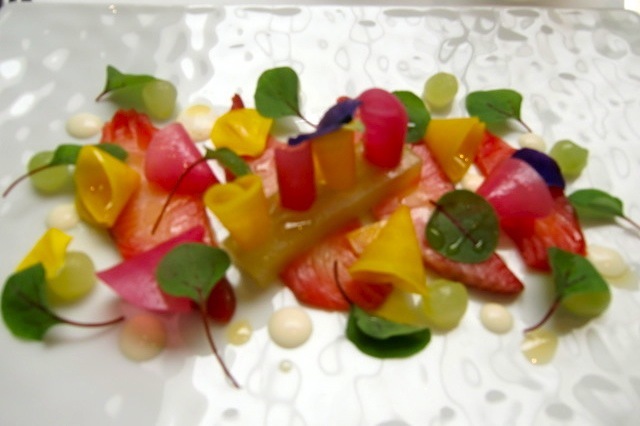 My wife’s chosen starter was a striking, vibrantly coloured arrangement of beetroot cured salmon and with pickled beets - a beautiful dish. For my starter, I opted for the snail dish. I love snails and these were the juiciest and most tender I have ever tasted. 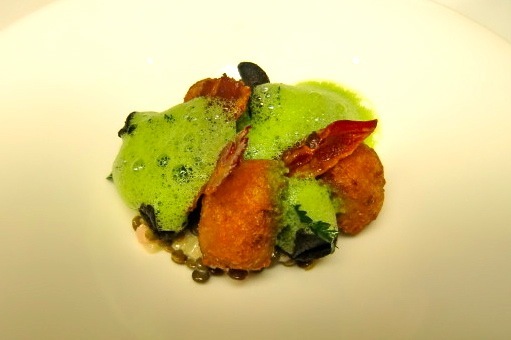 They were served with mushroom beignets; lentils, smoked bacon and a parsley velouté – the picture does not do it justice. My wife went for the pork main. Once again, the dish’s presentation was exemplary. As usual, she was kind enough to give me a taste; I remember the meat being wonderfully flavoursome and perfectly cooked - although, it was the little pillows of potato that particularly pleased. I chose the fish main. I can’t for the life of me remember much about this dish but, as the photo shows, it was another attractively presented dish that also delivered on flavour and technical execution. 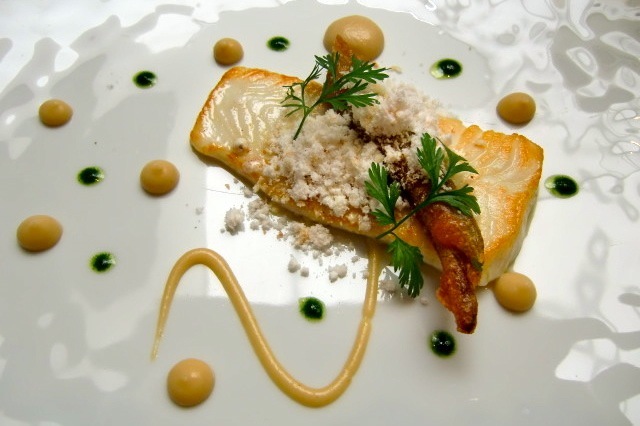 For more pictures of Pied à Terre’s exquisite looking food check out the gallery pages on their website (here) – truly stunning. I’m always keen to try ingredients that I have not previously tasted and this was the first time of trying loquat as a fruit and not in a jam. 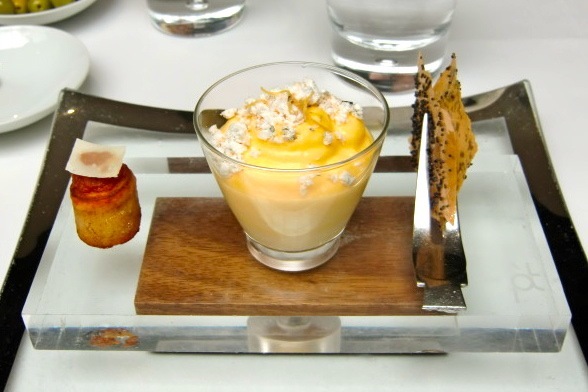 Served poached with honey jelly; a silky smooth vanilla bean ice cream and delicate almond tuiles, the dish had an exotic flavour without being too sweet. Once again, simple yet elegant presentation further enhanced this dish. 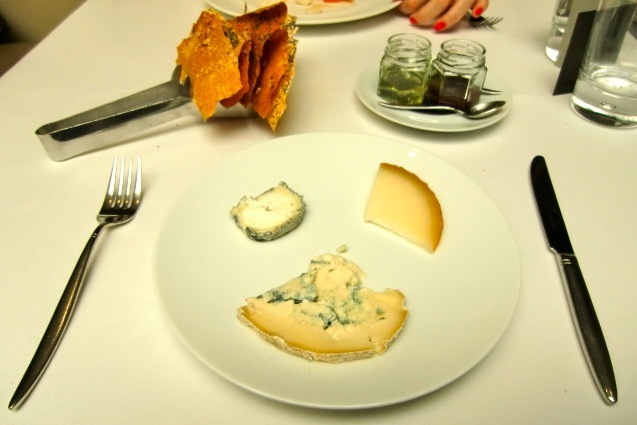 The cheese course featured three quality cheeses, served with more paper thin seeded wafers (imaginatively served on Spaghetti tongs) with a pot of chutney and honey. 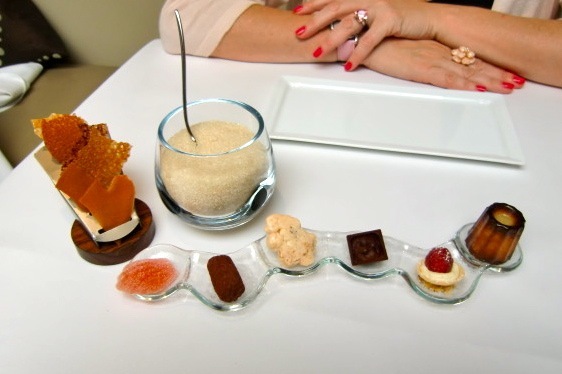 Our meal ended with a fabulous selection of petit fours, served with the coffee. 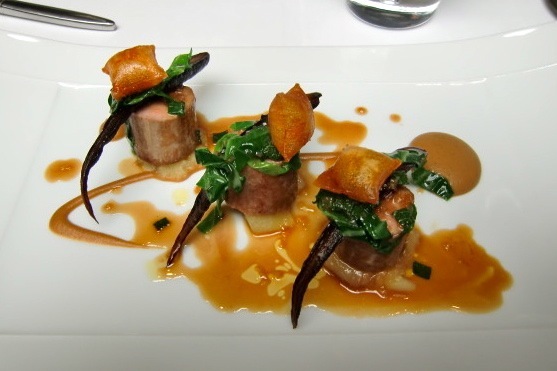 A terrific menu with interesting flavours and exemplary execution - for top notch service and faultless cookery; Pied à Terre is the restaurant, currently at number 10 in my all time Hungry Hoss Top Ten. Looking forward to seeing the rest of the countdown! Do you have a timescale in mind or are you just going to post each installment as and when?